Main application under 280T ,Selectable to hot runner system , capsule、fast food box and other Thin-walled packing container product pick-out application. 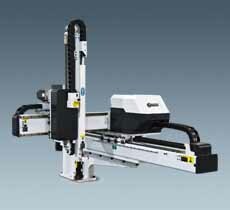 requirements and packaging features, Achieve few people automated production with conveyor. Telescopic arm use import wire belt achieve speed function,to improve the production efficiency .Min pick-out time 0.8 second, continuous production molding cycle within 4.5 second.